So here we are on June 24. We arrived in Guatemala in the wee hours of the morning. After our first meal at the local Denny’s (which was quite hopping at 2am by the way), we were on our way to Coban. The weather and windy up hill roads did not do us any favors. It was very hard to sleep. After about 6 hours in the van, a bathroom break at an outhouse, boulders in the road, and getting a little lost, we finally found Rosita! It was a very emotional welcoming to me. Seeing Rosita hug some of the others that she knew from prior visits, like Ellen, Cindy, Carrie and Pastor brought to light just how much our presence means to her. The children followed up the walkway, each one offering a hug and a warm hello. Rosita took us on a tour of the school. One classroom hosts several grades at one time different times throughout the day. Rosita told us the story of how she brought 8 of the children from the Rosa de Amor Orphanage to Coban for Easter. The past year had been filled with apprehension and sadness as the children learned of the possibility that Rosa de Amor would be sold and no longer their home. 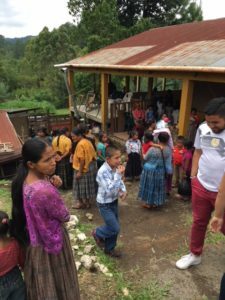 After coming to Coban two months ago, the children didn’t want to leave. Rosita has made a home for herself again in Coban and brings joy to the children and community she serves. My favorite part of today was my interaction with a little girl named Ava. She was at Bethlehem for the church service with her mom and brother. She kept me laughing as Sharon taught her how to wink! Ava just thought that was the best. All of the children responded to any smile or hug sent their way. Leading up to our trip, I was sometimes unsure of what we would “do” by being here. After only one day, it is clear to me that the doing is just the “being” here. I hope that makes sense. The children deserve to see that there are people who care about them and pray for them constantly back in Kingsville, MD. I think we are doing just that and I can’t wait to see what the rest of the week brings.